Burpelson Air Force Base could be anywhere. 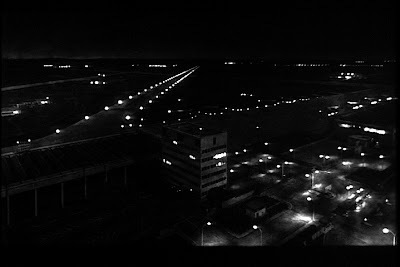 Some matte establishing shots – a series of nighttime scenes at the base – confirm both “heightened reality” and sense of artifice. The focal point of the first is a multi-storied modernist tower. Evoking corporate architecture, the building firmly roots this shot sometime in the late 1950s or early 1960s. Next to it, a hangar – not unlike one of Konrad Wachsmann’s own space frame designs – straddles a series of lit runways that criss-cross towards a vanishing point in the darkness. Off to the right of the tower, which is presumably some type of administrative structure, is a flight apron. 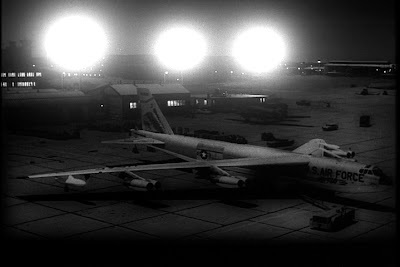 A series of B-52 Stratofortress bombers can be seen under the sporadic barium lights. In another establishing shot, a B-52G stands on the tarmac. The very same barium lights shine like nighttime suns, perhaps suggesting the idea that the very first moment of a nuclear blast is an explosion of light. Yet the very real nature of nuclear warfare is undermined by the fact that we are indeed looking at a model of bomber – not the B-52G itself. If one looks carefully, one notices that the outboard wheel assemblies are not touching the ground. Although this establishing shot focuses on the deadly arsenal of thermonuclear war, the scene is oddly pristine. The interiors of Burpelson Air Force Base also seemed untouched. And perhaps this is a testament that these spaces are regulated and monitored. The action at Burpelson occurs in two separate spaces. 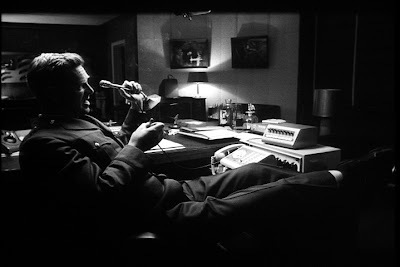 The dark, secluded offices of the maniacal General Jack Ripper and the clean, well-lit fluorescence of the computer salons where Group Captain Lionel Mandrake monitors data seem polar opposites. Yet these spaces are conceptually identical as they are places where information is processed, distorted, and disseminated. The processing, distortion, and dissemination of data are all mediated via two separate formats: radio signals and binary data. Ken Adam’s configurations of Burpelson’s interior spaces highlight this type of media regulation. It is no coincidence that the image of General Jack Ripper sitting in his plush chair and prophesizing thermonuclear doom conjures Joh Fredersen’s office in Fritz Lang’s Metropolis (1927). Both are the literal seats of technocratic power. Whereas Fredersen manages all levels of the Metropolis industrial combine from the comforts of his own office, Ripper wrangles the U.S. Air Force’s entire arsenal with a few simple commands. Ripper broadcasts his own anti-communist paranoia, claiming that the Soviets are about to unleash a “doomsday device” on American soil, and thus orders a pre-emptive attack against Russian targets. To command effectively, as well as to preserve the safety of forces under his own authority, Ripper effectively isolates Burpelson from the rest of the outside world. He also orders that all transistor radios be confiscated, as they may be used by Communists to persuade those inside the base that there is no threat at all. 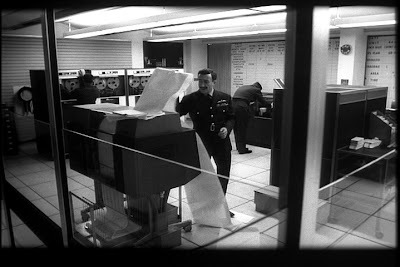 This isolation is further reinforced when, after telling Group Captain Mandrake about the media shutdown, General Ripper shuts the blinds inside the office. As with the runways and aprons outside, the only source of light is artificial. The importance of using a microphone to circumscribe radio use signals the importance of oral commands. For the German media theorist Friedrich Kittler, this would prove highly ironic. In what is perhaps his most well-known book, Discourse Networks 1800/1900 (Aufschreibe Systeme 1800/1900) (1990), Kittler paints a materialist media history that considers the effect of writing technologies in the years 1800 and 1900. In this book, Kittler observes that around 1800 a general shift took place from the closed world of the “Republic of Scholars”, a “system in which knowledge was defined in terms of authority and erudition” and “in which patterns of communication followed the lines of social stratification” , to a more open system of reading and writing based on the practice of alphabetization, which involves the translation of visible into audible language, or the oralization of culture. Though the action in Ripper’s office occurs well after the time that Kittler celebrates, the supremacy of the oral command is vital. It is as if Ripper’s command is a preemptive attack against the proliferation of popular media and the technologies that disperse it. The relative isolation of Ripper’s office, the proliferation of images of bombers and military paraphernalia on its walls, and the fact that the oral command comes from this room suggest something like a papal bull or diktat: a message clouded and distorted by the very spatial configuration that allowed it in the first place. What began as the simple capability of switching between the supervisor and the user … is extended to systemwide procedure in the separation of Real Mode and Protected Mode. Different command sets, different address possibilities, different register sets, even different command execution times, henceforth separate the wheat from the chaff, the system design from the users. Thus it is precisely in the silicon on which the prophets based all their hopes for a microprocessed democracy of the future that the elementary dichotomy of modern media technologies again returns. A German civil radio network, for example, was permitted from the day when the postal service of the Reich could credibly promise the armed forces that the consumer radios of 1923, which were capable of any possible transmission, would never be able to disrupt military-industrial radio communication because an automatic encoding machine .. had just been invented. The computer room at Burpleson Air Force Base thus counters Ripper’s oral evocation of a Protected Mode system. In a famous scene, Group Captain Mandrake, in open defiance of Ripper’s edict, turns on a small transistor radio and briefly dances to a strain of bossa nova music. The use of radio broadcasts as a form of resistance is certainly not new. Indeed, the initial mission of Radio Free Europe/Radio Liberty, the American radio network set up to create anti-Communist sentiment, was "To promote democratic values and institutions by disseminating factual information and ideas.” But within the confines of Burpleson Air Force Base’s computer room, the radio transmission serves a corrective function. Although a viewer knows, for a fact, that a Soviet nuclear attack is not happening, within the normative universe of Dr. Strangelove, the significance of the radio signal goes unheeded.